Research at Wagga Wagga has shown that flushing ewes by grazing them on green feed (such as lucerne) for one week prior and the first week of joining could result in higher twinning rates and around 10% extra lambs marked. However, the opportunity to graze ewes on available green feed needs to be compared to other options such as finishing lambs or growing weaners during the summer/autumn months. The Green Feed Allocation Tool can be used to help with this decision by comparing the economic benefit of each option, accounting for variables such as current stock classes, available green feed, lamb prices and feed prices. The calculator incorporates feed budgeting calculations to determine the number of stock that can be grazed on green feed, the area required to graze stock and a cost benefit analysis for the most suitable and economic use of available green feed and/or supplementation. The calculator is divided into two scenarios in which flushing can be utilised; a Prime Lamb Enterprise scenario and a Self-Replacing Wool Enterprise scenario. Examples of how the tool can be used are provided below. The Green Feed Allocation Tool can be downloaded here. 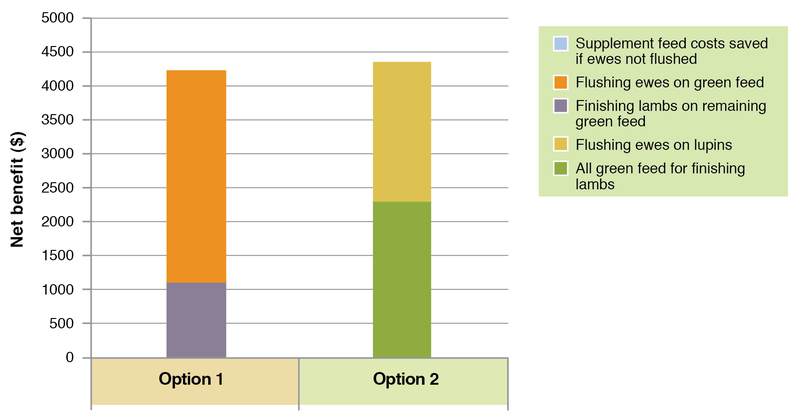 The Prime Lamb Enterprise scenario compares the cost-benefit of using available green feed to flush ewes (resulting in more lambs sold the following season), or finish spring-born lambs to higher sale weights. There are two Options to work though in the calculator. Option 1 calculates the return from flushing ewes on the green feed and grazing lambs on any remaining area. Option 2 calculates the return from flushing ewes by feeding lupins (or maintaining ewes with cereal grain), and using the whole area of green feed for finishing lambs. Geoff has an area of his property that is sown down to lucerne and wants to know what would be the best option to graze the lucerne; either with his dry ewes prior to the autumn joining period or some lambs he is hoping to grow out to 42kg before sale. Of Geoff’s 100ha property, 10ha is sown to lucerne. He is thinking of flushing a group of 60kg ewes for a period of 14 days. As he is hoping to get more lambs from these flushed ewes, he estimates that the average lambs for next season will be 20 kg CW/hd, will receive an average lamb price of 423 c/kg, and skins will be sold for $12/head. His selling costs are usually around 6%. Geoff knows that ewes carrying multiples require additional energy in the lead-up to lambing and during the lactation period. For this reason he has decided to estimate the costs required if they need to be supplemented with feed. He estimates the extra feeding costs at $7.50/ twin bearing ewe, equating to approximately $1.50/head during pregnancy and $6/head during lactation at a grain price of $240/tonne. Geoff measures the current green feed on offer in the lucerne area as 2000 kg Green DM/ha. The pasture is green and growing, and he estimates pasture quality as 75% digestible – 11MJME/kg DM. The growth of the lucerne is currently 20 kg/ha/day and while grazing he expects a wastage factor of 20%. He has also decided that ewes will be removed from the paddock when FOO is grazed down to 800 kg DM/ha. From the calculator outputs Geoff can see that he is able to graze 530 ewes for two weeks on his lucerne, however he was only intending to flush 350 ewes. For this reason, Geoff does not require all the available lucerne to flush his ewes, only an area of 6.6ha. From grazing the lucerne Geoff expects around a 14% increase in the number of ewes which will be carrying multiples and his survival of twin lambs is usually around 70%. Given these inputs, Geoff could expect around 34 additional lambs at the time of marking next year and these lambs (depending greatly on the lamb prices being received at the time of sale) could sell for around $90/head. As Geoff can get a similar response from flushing with lupins, he decides to compare the benefit of flushing with lupins to lucerne. He would need to feed 0.5kg/ewes/day for 14 days and expects to pay $350/tonne for lupins. His labour requirements for this would also be 0.5 hours at $23/hour to feed out lupins for the two weeks and he would expect a similar flushing response of 14% more ewes carrying multiples and 70% survival of twin lambs. As Geoff has an area of 3.4ha not required to feed ewes he may decide to want to fence this area off to graze and fatten lambs. His inputs to calculate the number of lambs that can be grazed are; 2000 kg Green DM/ha down to 1000 kgDM/ha with a pasture quality of 75% digestible – 11 MJME/kg DM, growing at 20 kg/ha/day and with a wastage factor of 20%. Given these inputs, Geoff can graze approximately 100 35kg lambs for 25 days, taking them up to a liveweight of 41kg. During this short grazing period he is hoping for all of the lambs to survive (99% survival), achieve a weight gain of approximately 245 g/day and is expecting the lambs to dress at 45% and receive 400 c/kg CW. From this grazing he could then expect a net income on the weight gained while grazing on the lucerne to be $1,087. As he is considering flushing his ewes with lupins, this would allow the total 10 ha to be utilised by the lambs, and given all the same inputs as the grazing lambs on 3.4ha, he would now be able to graze 277 lambs on the 10ha. He decides he would only graze 200 lambs and could expect a net income on the weight gained while grazing on the lucerne to be $2,174. 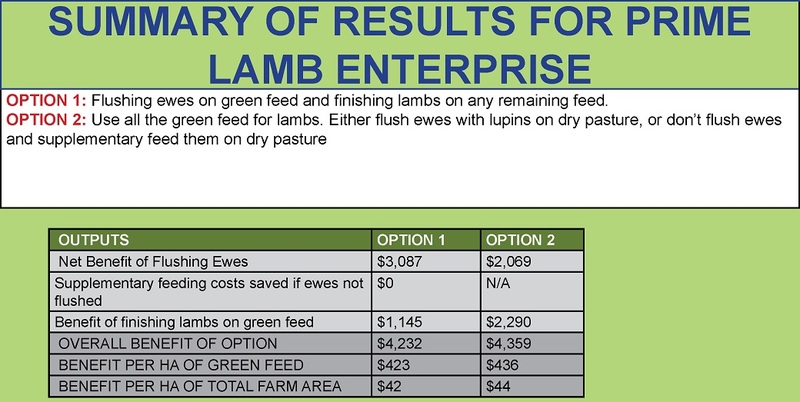 A analysis shows that in this scenario, flushing the ewes on lupins and using the lucerne for the lambs gives a slightly higher return ($4,359, $44/ha total farm area) than using the lucerne to both flush ewes and finish lambs ($4,232, $42/ha total farm area. Click on the table images to bring up the pdf in a new window. The Self-Replacing Merino Enterprise scenario compares the returns from using available green feed to flush ewes, or feed replacement weaners over the summer period. Feeding weaners green feed over summer can reduce the cost of supplementary feeding to meet joining weight and condition score targets. Weaner survival may also increase when fed green feed instead of grain or pellets if weaners are not trained onto the feed. As with the Prime Lamb Enterprise Scenario, the benefit from flushing relates to extra income from selling more lambs (sold as either prime lambs or store lambs) in the following season. There are two data entry sheets and two grazing options within this calculator to work through. 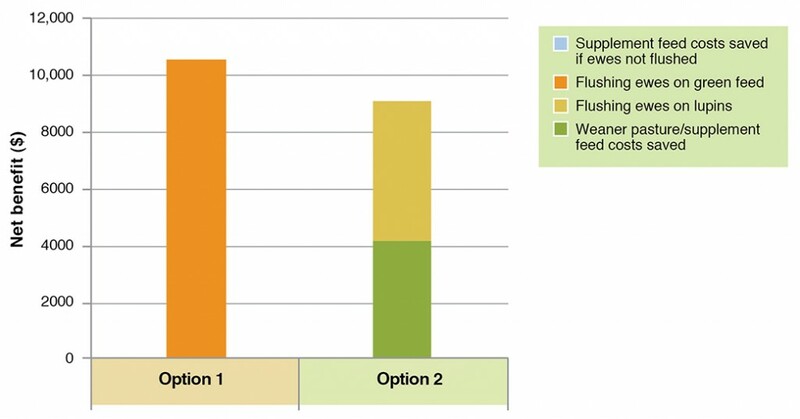 Option 1 calculates the benefit of flushing ewes on green feed and using any remaining area to graze weaners. Option 2 calculates the benefit of flushing ewes with lupins (or maintain ewes with cereal grain) and using the whole area of green feed to graze weaners. The costs saved by grazing weaners on green feed is calculated as the difference in the feeding costs (number of weaners requiring feed x price of feed) between Options 1 and 2. Sally is running a self-replacing flock of Merino ewes, which she plans to join in autumn. Having an area of the farm that is sown to lucerne and chicory, Sally wants to know if it would be more beneficial to use her available green feed to flush her ewes, or to graze weaners, saving on supplementary feed. Sally’s property is 250ha in size, with her lucerne and chicory paddocks totalling 30ha. Sally runs a ewe mob consisting of 1800 medium framed (50kg) merino ewes, which are currently in a condition score range of 2.5-3. She also sells lambs that aren’t kept for replacements as stores at weaning for an average price of $60 (before selling costs) and is thinking she will likely sell her twin lambs before the singles. Sally also tries to lamb single and twin bearing ewes separately and has budgeted for additional supplementary feeding costs of $7.50/additional twin bearing ewe. The current green feed on offer (Green FOO) in the lucerne and chicory paddocks is 2000 kg Green DM/ha with an estimated pasture quality of 75% digestible – 11 MJME/kg DM, growing at 20 kg DM/ha/day with a wastage factor of 20%. Sally wants to graze her ewes on the green feed for the 14 day period and allow it to be grazed to 800 kg DM/ha before moving her stock off this feed. The calculator is telling Sally, given the feed attributes, she would actually be able to graze 1950 ewes, and that by grazing 1800 ewes (her whole flock) she will require 27.6 ha of the total 30ha. Sally expects around a 14% increase in the number of ewes which will be carrying multiples and survival of twin lambs around 70%. Given these inputs, Sally could expect around 176 additional lambs weaned next season worth a total value of $10,560, a net return of $35/ha total farm area. Sally could also induce a flushing effect feeding 0.5 kg lupins/head/day for the 14 day period, however this is likely to be much more costly with the current lupin price being approximately $440/tonne. Sally includes the labour cost of feeding out lupins (0.5 hours at $23/hour). Having the same response in expected lambs (176 additional lambs), this would result in a lower net return of $19/ha total farm area. As Sally has an area of 2.4ha not required for flushing ewes, she may decide to graze some of her lighter weaners on this area. Using similar pasture inputs as to what was entered in the ewes section (2000 kg Green DM/ha, 75% digestible – 11MJME/kg DM, growing at 20kg/ha/day) and grazing to a minimum of 1000 kg DM/ha, Sally can comfortably graze 60 30kg weaners for 30 days. Her other option is to use all the green feed for weaners (to save on supplementary grain feeding). With this option she is able to graze 700 weaners for a period of 30 days. If she was feeding barley grain at 1 kg/hd/day for the same period for 640 weaners [number of weaners in option 2 (700) minus number of weaners being grazed in option 1 (60)] at $190/tonne plus labour costs (0.5hrs at $23/hour), this would cost $4166 total supplementary feeding, the cost saved by feeding all weaners rather than some weaners on green feed. 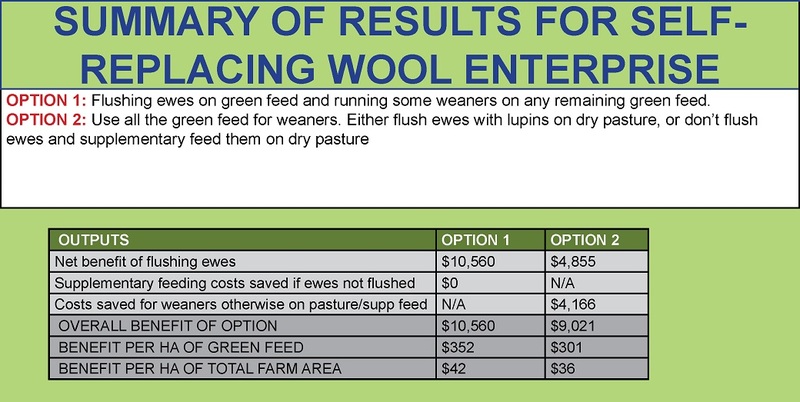 The analysis shows that the overall benefit of flushing ewes and some weaners is $10,560 ($42/ha total farm area) which is slightly higher than flushing using lupins combined while using all the green feed for feeding weaners ($9021, $36/ha total farm area). The difference in this example is a result of the high lupin price ($440/tonne). 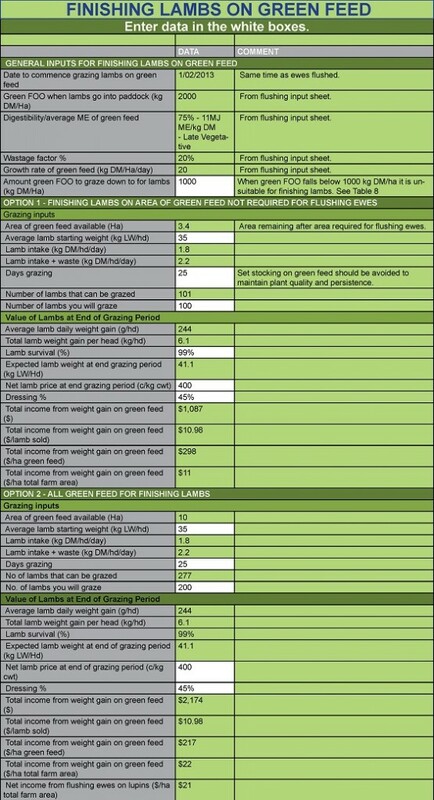 Use caution when completing feed budgets – the calculations and resource tables used within this tool have been put together with the best information available, but should only be used as a guide. It is essential that pasture and animals are monitored regularly. The return from using green feed for flushing ewes compared to finishing lambs or growing out weaners varies depending on the available green feed and the market price for lambs and supplementary feed. It is important to consider that this tool is a guide only to provide decision support for the tactical use of available green feed. When grazing stock on lucerne or other green feed over summer and autumn, pastures and livestock need to be monitored to manage feed availability, animal health and productivity. Set-stocking lucerne for extended periods of time should be avoided as lucerne will lose its overall quality and plant persistence will be reduced. Animal health complications, such as red-gut, can also occur when sheep graze large volumes of high quality lucerne and clover pastures, or other fresh, young green feed. If considering flushing ewes, lamb survival should also be considered. Survival of twin lambs is often lower than single-born lambs, and, if twin lamb survival is low in your livestock system this option may not be suitable. See the Wagga Wagga EverGraze message – flushing increases the number of lambs born, for further information. The Green Feed Allocation Tool was designed and developed by Laura Garland and Kate Sargeant from Agriculture Victoria and Lee Beattie from Beattie Consulting Services. The research on flushing ewes on green feed was conducted by the Wagga Wagga EverGraze Proof Site team from Charles Sturt University. The Wagga Wagga EverGraze Regional Advisory Group also contributed to the development of the questions answered in this calculator. Figures used in the calculator have been sourced from the Lifetimewool project, the Prograze manual and the High Performance Weaner workshop (Rural Industries Skills Training). Knight TW, Oldham CM, Lindsay DR (1975). Studies in ovine infertility in agricultural regions of Western Australia: The influence of a supplement of lupins (Lupinus angustifolius cv. Uniwhite) at joining on the reproductive performance of ewes. Australian Journal of Agricultural Research, 26, 567-575. King BJ, Robertson SM, Friend MA, Wilkins JF (2010). Short-term grazing of lucerne and chicory increases ovulation rate in synchronised Merino ewes. Animal Reproduction Science, 121, 242-248.